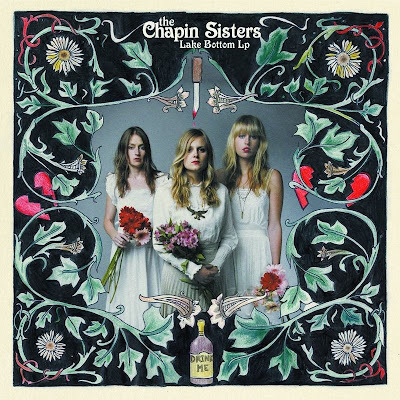 I wanted to like The Chapin Sisters, but I can't help feel like they are a humorless, tuba-less version of The Kranksy Sisters. Quite heavy on the dour, girls. And you have to feel bad for the one non-Chapin Chapin Sister, Jessica Craven, both for being the the third of the trio that doesn't match and for looking so much like her dad, director Wes Craven, that it's spooky. Which is kind of appropriate, if you think about it. On the other hand, I have to hand it to them: For three women all caught up in the Southern gothic schtick, they couldn’t have picked a better name for their album than Lake Bottom. Also, I search YouTube and found some footage of The Kransky Sisters that wasn't up the last time I checked. You have to admit: The two bands have a similar take on the the three-woman harmony. Watch the below video, but fast-forward past the jokes to 2:30 if you just want to hear the vocal similarities. Also, I can't help but notice that, like The Chapin Sisters, The Kransky Sisters have one member with a different father than the other two. The Kranskys, at least, make a point of mentioning this as often as possible. Feh, none of them are anything compared to the Roches.